The past couple of days have been very strange for me, as I left my job yesterday ready embark on a new career! It still doesn’t feel like I have actually gone, and today just feels like a day off. I worked for the company since leaving school almost six and a half years ago, and although I was more than ready to move on to bigger and better things, I will definitely miss it, especially all the friends I’ve made! Today I went out for a spot of lunch and shopping with my sister and parents. We went to an amazing little Chinese restaurant for lunch, then had a look round the town centre, stopping off at Sainsburys on our way home. They have 25% off all TU clothing and accessories at the minute, so I snapped up some gorgeous clothes for my new job which you may have seen if you follow me on Instagram or Twitter! 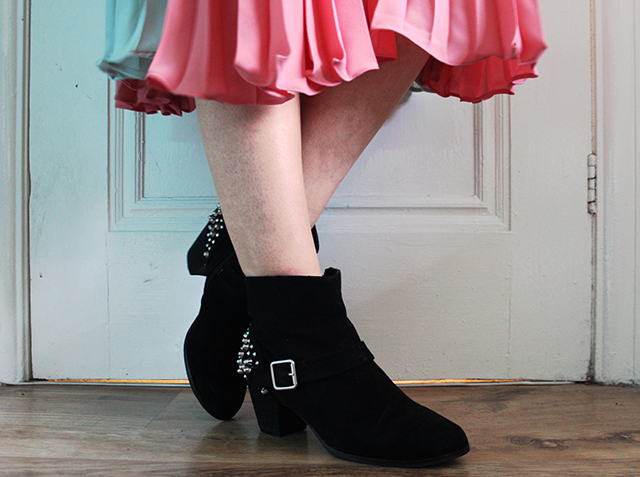 This is the outfit I wore out, including a beautiful Glamorous skirt I got recently from Zalando. 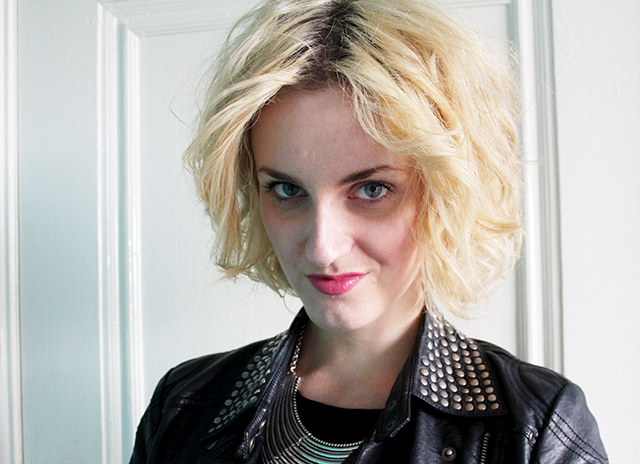 I love the pretty colours and feminine shape, but decided to toughen it up a little with leather and studs. 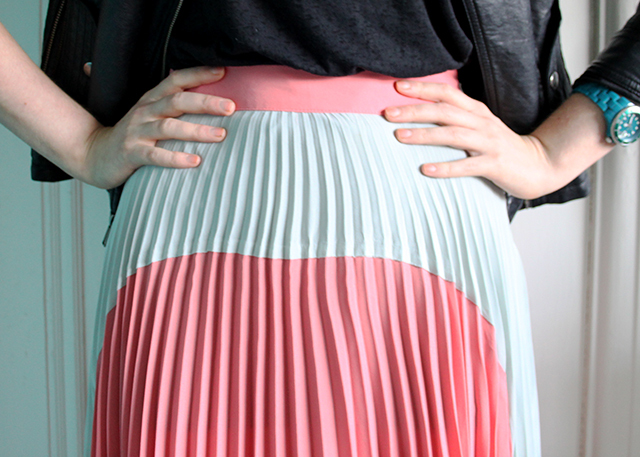 As you can see, the skirt is really unusual with the block colour detail. I’ve seen a few of these around on the high street but never really took much notice of them. This one caught my eye though for some reason, probably the colour combination as I’ve never seen one in these shades! The only problem I have with it, is it is pretty see through, but nothing a slip or long vest won’t solve. I wore a long Topshop fitted vest underneath it, a basic bodycon one that wouldn’t ruin the rest of the look, and that worked just fine. I can see this skirt working really well in my new work wardrobe too, with pretty blouses and jumpers in winter, and even next season with sandals and simple tees! What do you think of this skirt? Have you bought anything from Zalando recently? 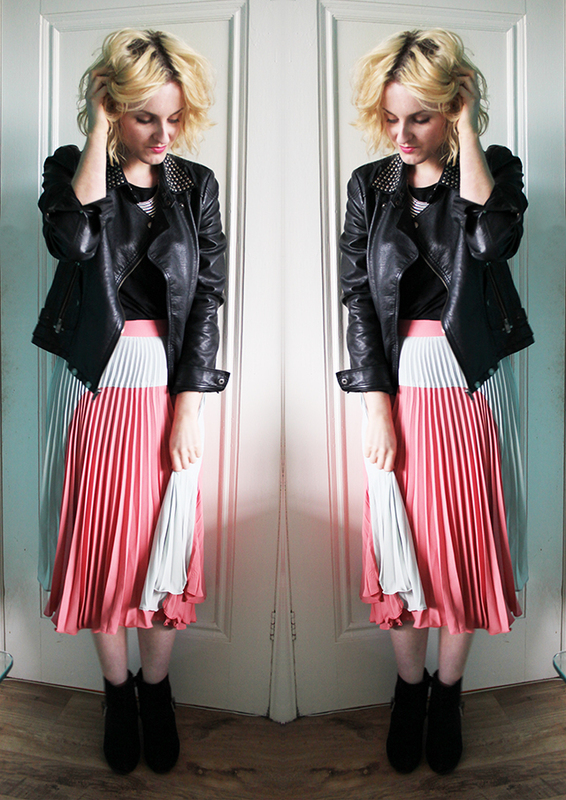 I love the skirt and the way you make it a bit more edgy for the autumn! where did you get your blog design from/ who did it? !